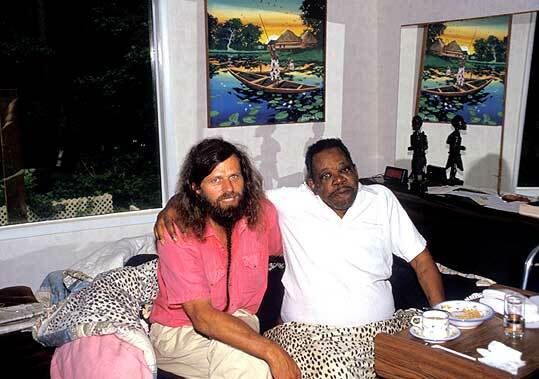 With Dr. Charles King on his deathbed in Atlanta where he died from cancer. King was one of my greatest inspirations in my anti-racism work and my mentor for my racism workshops. I do not have his strong personality, which he used so effectively in his "oppression-workshops," but feel deeply indebted to him in my teaching. He was only capable of oppressing whites so profoundly because he had a profound and contaminating love for them. As much as the whites would hate him during the first day of his "oppression," as much would they love him on the second day of his workshops. He conducted them all over America for city councils, the military, CIA and big corporations to help improve their race relations. When he let me take over one of his workshops for top executives of Atlanta's biggest newspaper, Atlanta Constitution, I thus felt deeply honored when he introduced me as "the only living John Brown in America." Today his work is being continued by my friend and coworker, Tony Harris.